Two weeks ago I ordered monogram decals from Preppy & Co’s Etsy shop, they were having a BOGO (Buy One Get One) deal (come on, who could pass that up?) I bought the decals pictured, but also others, roughly $25 worth (thank goodness for old gift cards!). Anyway, Preppy & Co has so many different color options for their monogram decals, the monogram fonts available are: Script, Vine Curly, Circle, Circle with Border, Times, Stacked, and Block (photo attached). These decals can go on your car, notebooks, tumblers, laptops and anything with a smooth surface. They are very durable and they start as low as $2.00! That is awesome! If you want to see what they look like on items, check out the pictures I posted! I hope you like them as much as I do! 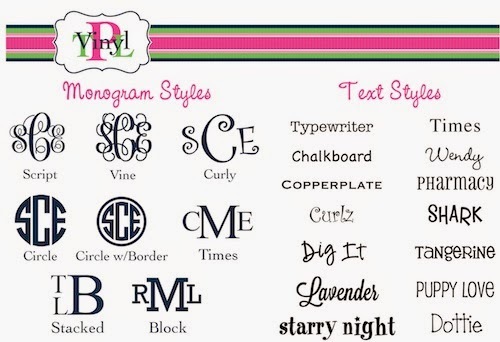 If you want some of these awesome monograms you can either get them from their website or their Etsy shop! You should definitely check them out because they have more awesome stuff besides monogram decals.